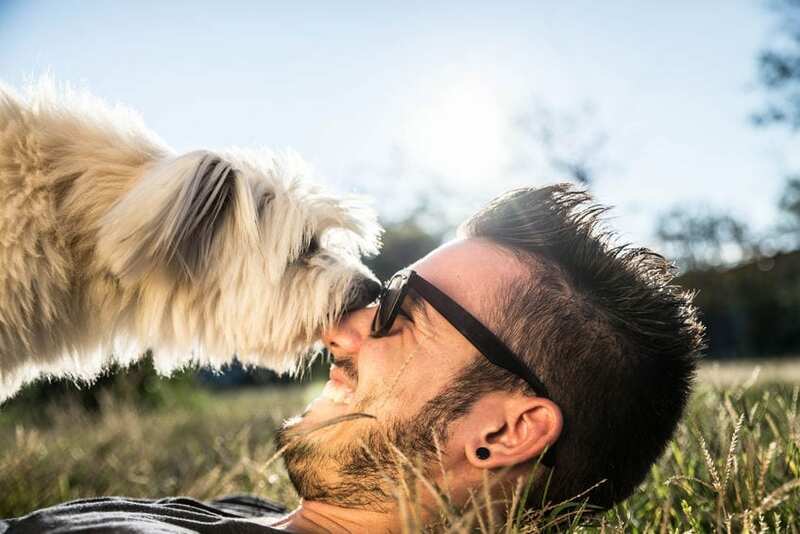 The relationship between humans and animals is special because somehow, when the world gets to be too stressful, or when you seem to face any type of challenge — your pup is there. And your pet doesn’t judge you, doesn’t ask you to explain. Your dog simply lays its head in your lap and loves you. The loss of a pet is a terrible loss. 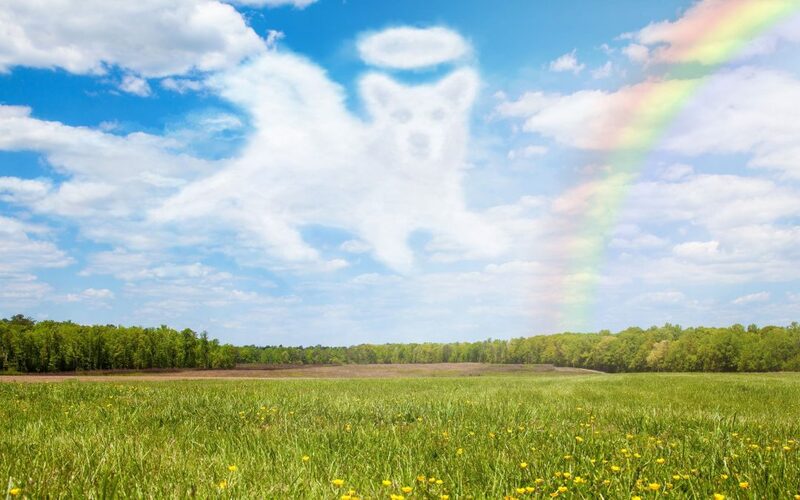 There’s a poem, called the Rainbow Bridge poem, that can help you mourn the loss of a pet. It starts so sweetly and unassumingly. You bring your pup home. 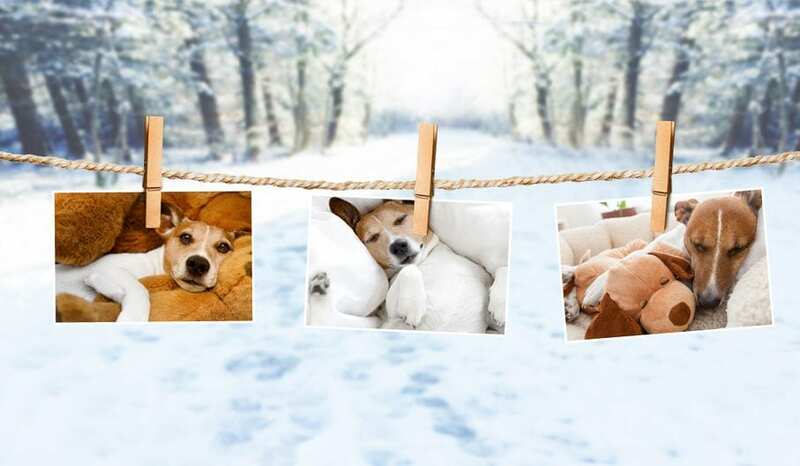 Whether it’s a newborn pup or an older rescue, it doesn’t take long for you to get used to your pet in your home: digging through your laundry, sleeping on your shoes, and licking your eyelids to wake you for a walk. And before you know it, your pup’s a part of your life. Loves you, needs you… and you need your pet more than you thought you would. It’s strange because they can’t speak… but they understand every word you say (namely “walk,” “treat,” “bath,” and “love”). So, when the day arrives, and it is inevitable, how do you cope with the loss of a pet? Of course, some people assume pet grief hurts less than human grief, but they couldn’t be more mistaken. The human-animal bond is powerful — if for no other reason than that you can truly love one another unconditionally. Your dog made your home feel like home; therefore, pet grief can mean feelings of isolation, anger, frustration, and extreme sadness. Losing a pet is never easy, but poems and lyrics like those in The Rainbow Bridge poem might remind you that it’s okay to feel and to remember. Of course, mourning is extremely personal — the loss of a pet can be hard because even when you’re alone at home, your pet is with you. The silence when your pet is gone can hurt more than the most deafening sound. So, you’ll want to allow yourself to mourn in a healthy way. Wouldn’t your pup want you to be happy, remember the best, but also move forward, knowing you shared something wonderful? There are no rules when it comes to how you cope with loss of pet. One potential guarantee is that it won’t be easy, and as stated by the Palliative Care Editorial Board, “Grief… cannot be dealt with in a cookbook fashion”. Your personality, and your particular relationship with the pet who passed, will shape your needs. Culturally and religiously, you may have ways of handling loss that differ from those around you… that’s more than okay, too. Listen to your heart. Ask for what you need. If you need some time alone, ask for it. Conversely, if you’d rather not be alone, ask for company. Share stories. Look back at photos and reminisce. The big thing to remember when seeking out ways to deal with losing a pet is that you do not have to go it alone. 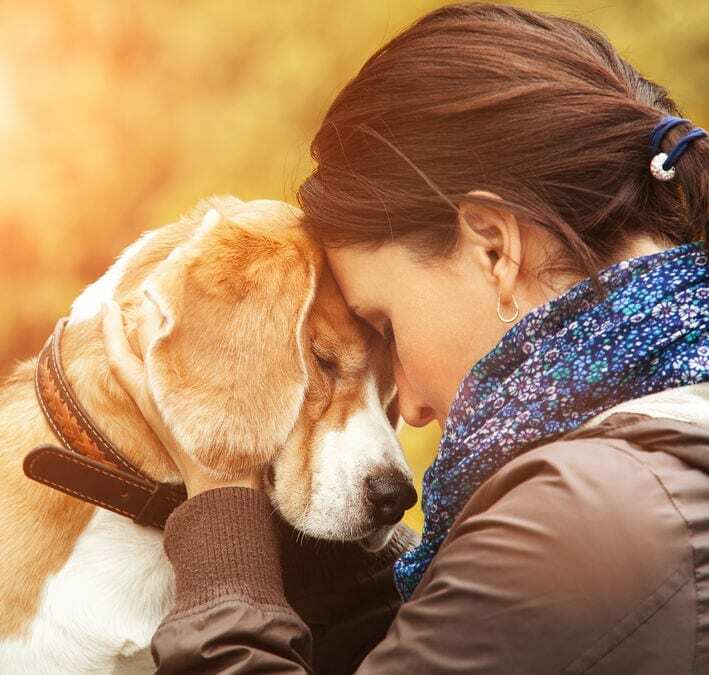 There are several forms of support out there for grieving pet owners. In fact, there are even pet-bereavement counseling options. And The Humane Society of the United States even recommends calling a “losing a pet” support hotline if need be. 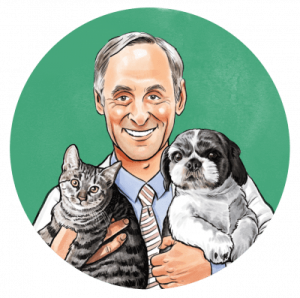 Usually, you can find pet-bereavement groups by jumping online. Or there may be posted flyers at your local market, library, vet, or groomer. If you’re still struggling, or you prefer a more private approach to handling your pet grief, check out books on the subject from the library, read articles in magazines, or search for assistance online. Call friends, family, other pet owners. Ask your local groomer or vet, someone who knows you and loved your pup, for referrals to grief groups. Your vet might even be able to simply connect you with someone going through the same thing. Host a memorial for your dog. This can be public or private. Keep a pet grief journal. You can write in it for as long as you feel you need to. You can record memories, or let out frustration. And if you want, when you’re ready, you can bury the journal outside. Listen to music that allows you to reflect and reminds you of your funny pup and the things they used to do. When you’re ready, switch the mood to some motivational, get-up-and-go beats. Get moving. It could help you clear your mind to continue walking at the same times during which you walked your pup. Eventually, you will be able to move on. You may decide to get a new pet, and that experience can be as richly rewarding as the last one, even though it’s sure to be different. No dog can replace the pet you lost, but building a new relationship could help you heal and bring you new joy. Again, nobody experiences grief in the same way, but print The Rainbow Bridge poem out. Keep it with you for as long as you need to. And then, if you happen to come across another grieving dog owner in the future, you can share this poem that has become so popular. The human animal bond needn’t be mysterious. There’s no need to diminish the meaning of your relationship with your pet just to move on. These things take time. Give yourself that time. I was away on vacation, I thought it may be time for Molly to cross the bridge, but a month before my trip,when I talked to my 16 yr old son, he said “not yet”. She was clearly showing signs of dementia, I should have done it. I even took her to the vets for their opinion. So, while I was away, my precious Molly wondered off. A sweet angel found he injured on the side of the road & took her to the vets. Her injuries were too much for her and she had to be put to sleep. It breaks my heart that I wasnt here to protect her & to hold her. To let her know how much I loved her & what a good dog she was. I wish I could have held her as she crossed over. I’m just incredibly sad. I lost my beloved dog, Clementine, yesterday. It was the hardest decision I have ever had to make and I did it at home with her in her favorite spot on the couch. She was – and always will be – my heart and my sole, my joy and my sunshine. I can’t imagine ever getting over her loss or being able to stop crying for more than ten minutes at a time. I have suffered from depression all my life and I thought I was doing pretty well on a combination of anti-depressants. However, I never believed that I would ever be able to feel true happiness and content due to this affliction. It was it was and I had accepted that. I was greatful for what the anti-depressants were able to do for me. Ten and half years ago Clementine came into my life and my life changed completely in nearly an instant. They have been 10-1/2 years of true happiness and content like I could never have imagined. My heart is now forever broken. I have another dog as well whom I love dearly and she has been an angel throughout this ordeal. I don’t love her less, I just love her differently and with all my being. I’m sure I will have others as well. But, Clementine, my precious baby girl, I will always, always love you and I will carry you in my heart forever and ever. Thank you for sharing The Rainbow Bridge. When the time comes I will be running just as fast as Clementine to get my hands on her again. Today we said goodbye to our sweet Katee. She brought us love and joy for 12 years. Our hearts are broken and the loneliness is unbearable. We know you are well now. We will always love you. All I can say is thank you for understanding.